An update for all of those who Google on Tina Conner and find, well, me. The nursing home that is Birchtree Healthcare appears to be closing soon. Bankruptcy trustees have until Monday to find a buyer. A small point: The new buyer will come into that home the same way Conner did - by buying it after a bankruptcy which followed health and safety violations cited by state and federal authorities. Oh yes, as for allegations that Governor Paul Patton (D-insignificant lame duck) had inspectors sent to Birchtree because Conner broke off an affair with him, nothing new there. Still the sameold sameold with the allegations. Daily Kos engages in a little 'what if' regarding Trent Lott. Upshot is that Lott could be pushed out of the Senate altogether for various reasons. Since Mississippi has a D governor, the possibility of Dem Senate control again is not out of the question. I think Lott is enough a partisan to do stick around though. I think Lott will do what David Durenberger (R-unethical) did when he was denounced by the Senate for his business dealings and stay as a back-bencher until the end of his term, when, hopefully for America, Lott will just go away. After all, it's not as if the balance of power in the House was at stake when Newt bellyflopped in '98 and Bob Livingston was about to be outed by Larry Flynt soon afterward. Did I mention that you should be reading The Daily Kos every day? Atrios says that today's Daily Howler is a must-read. And why is that? Because it not only puts the lie - yet again - to a liberally-biased press. It also offers evidence that the press is actually biased in favor of segregationist conservatives. Read to the end. You'll be glad you did. If you ask me, it doesn't look particularly recent. If I had to make a guess, the one with the glasses and back turned toward the camera looks like Tariq Aziz, whose head of hair was significantly grayer in 1991 than that seen above. So I'm guessing early to mid '80's. UPDATE: It's late 1983, early 1984. 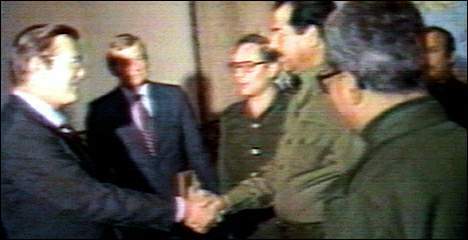 Rumsfeld was sent by the Reaganites to cement ties between Washington and Baghdad. Allegations of chemical weapons use against Iranian soldiers were made, according to something Bart linked to. And yes, that probably is Tariq Aziz. John Snow is the Shrubbery's choice to replace Paul O'Neill as Treasury Secretary. Hesiod finds it interesting that Snow was a big supporter of John McCain in the 2000 primaries, which might cause a bit o' vengeance on the Shrubbery's part. Nathan Newman has something on why Snow is such a big supporter of McCain and his efforts to bust railroad worker unions.